Unibet appeared on the gambling market a little more than 20 years ago, and despite the fact that the company cannot boast such a great history as the famous British bookies, today this betting website is among the most popular in the world. The homeland of this bookmaker is Sweden, however, this did not prevent the company from providing its services in more than 100 countries and today it has attracted more than 16 million customers! It seems incredible, but by the number of players who prefer to bet with this Swedish bookie, Unibet is among the best bookmakers in the world. The company achieved such success for a rather short time, thanks to three main components: high odds and mind-blowing choice of markets; one of the best live services and a huge selection of live streaming; never-ending promotions, which not only provide players additional profit, but also turn betting into endless fun. On this site, you will find a strong Casino and gambling section, as well as many useful betting tools, you can even play with other customers in various games! 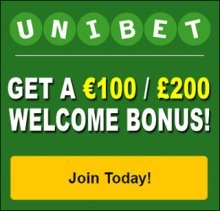 If you are not yet a customer of Unibet, then you can count on a generous bonus when registering. The bookmaker is licensed by the Malta Gaming Authority. Of course, you can be sure of the best choice of markets for all sports and leagues here, but the Scandinavian championships are presented simply above praise, which does not surprise anyone, given the roots of this bookie. The company was twice recognized as the best bookmaker in Europe, repeatedly won in several nominations, and has always been recognized as one of the best sites that provides impeccable in-play live betting service. Unibet betting application is considered one of the best products on the market, so you can be sure that you can bet on the go as easily as at home on the PC. The registration process on the website is very simple and comprises four basic steps, which will take only a few minutes. You will need to confirm your e-mail, and then to withdraw funds you need to go through an authorization procedure that confirms your age and place of residence. Despite the leading positions in the betting market, the website of this bookmaker leaves much to be desired. Of course, you will find many rave reviews on the web, but the evaluation of the design and functionality of the website is still subjective. Let us be honest, and no one will deny this – this site is not the fastest to download. When you go to any section of the website, the whole screen is reloaded and it takes a few seconds, while most competitors have this operation instantly. On the main page, you do not get instant access to sports and markets – this is a major drawback, because you have to spend some time searching for the needed bet, making a lot of clicks. The main top menu offers access to the following sections: Spotrs, Casino, Live Casino, Games, Bingo, Poker, Apps and Promotions. Below there is another menu for access to the Sports and Live Betting sections. There are three columns on the main page, the main events of the day are offered in two of them, and in the right, you will find a list of the current promos and other advertising information. To find the game you need, you can use ‘Search’, but this is not the fastest and not always effective way. In order to select an event, you have to make a few clicks: first select ‘A-Z’ menu and select a sport. You will not believe it, but this operation does not bring you closer to the aim, since you will get to the page with a list of live and upcoming events – you will have to click on ‘Browse Football’ once again and only then, you will see the list of countries in alphabetical order. Select the country, then the league from the drop-down menu. Then you can click on the match and see all the betting markets. Therefore, to see the odds for the market you are interested in, you will have to make a minimum of six clicks – that is too much! When you select a match, the whole screen will reload – the list of all league games will be on the left, the markets for the selected game will be in the center, you will see sports statistics on the right, which you do not always need actually. After selecting a stake, it appears in the coupon that moves across the screen in the lower right corner while you scrolling page. On the one hand, it is convenient, but on the other hand, the coupon is so large that it closes other betting markets, thus, it causes some inconvenience when you selecting outcomes for the multiple bet. A really useful feature is the filter where you can select the bet type (Match & Total, Both Teams To Score, Double Chance, Half Time, Draw No Bet, Asian Handicap, Total Goals by Team) and see the odds for only this market for all matches (within a certain league). All games that you can watch on the site are marked with the icon of ‘UnibetTV’, so you always know about the availability of live streaming. All markets are divided in groups on the screen, so it is easy to find the needed bet, only 1X2 markets, Total Goals, Double Chance and Both Teams To Score are automatically displayed. It is worth to note that Unibet offers the best odds in the world on BTTS! However, it is unlikely that you will be able to place a large sum on this outcome, as this bookmaker accept large bets only on 1X2 markets on popular leagues, but for small markets and minor leagues the limits are very low here. However, this problem should worry only high rollers! Maximum winnings are 20,000 per bet here, which, of course, is low. One of the main advantages of this bookmaker is a large selection of betting markets, which can be called one of the largest in the world, perhaps only Bet365 and 10Bet can compete with Unibet in this component. If we are talking about football, for example, the ‘Total Goals’ starts from 1.5 and goes to 7.5, you didn’t see that very often! Apart from the main types of bets, you will always find such markets for a football game as First Goal, Team Goals, Team to win, at least one half, Team to win after being a goal behind, Team to score first and win the match, Correct Score, Half Time/Full Time, Draw/Win and both teams to score, Goal in both halves, etc. Particular attention should be paid to Asian handicaps on this website, because this type of betting is now gaining great popularity and one of the most effective kinds of betting, at the same time, unfortunately, most European bookmakers do not offer Asian handicaps. Unibet offers a huge selection of Asian handicaps, for a football game from the top league you can see about 24 handicaps per team, starting from -/+ 0.25 to -/+ 5.00! As for the odds quality, here the bookmaker is among the best again, the odds can be characterized as above the market average, and for some markets they can be the best offers. Overall betting margin is about 4.3%, you can find strong odds on football with 3.9% of margin and tennis with only 4.0% of margin. As usual, betting margin on ice hockey is a little bit higher – about 5%. As for North American sports, the odds are nice too – 95.5% payouts for basketball and baseball, 96% for American football. The Unibet Casino section will satisfy any needs, here you will find Live Roulette, Live Blackjack, Money Wheel, Casino Hold’em, Live Baccarat, Caribbean Stud Poker, Ultimate Texas Hold’em, Three Card Poker, Scratch, Keno, Arcade, Slots and hundreds other games. Unibet in-play live betting section is perhaps the main advantage of this website! You can count on even better and more extensive service in comparison with pre-event betting lines. Almost all of games will be offered for live betting and the number of markets will be huge. Most of the top sports events you can watch on the site – this bookmaker has one of the best video broadcasts coverage, which of course is very important for live betting. Unlike the pre-match betting console, live section is very handy and fast! When you visit in-play live betting console you can see a list of all current events by sport. Choosing a certain game, you can see all the betting markets in the center of the screen, while in the left column will be all live events at hand – it is very convenient for quick navigation. In the right column, you can watch the video broadcast, there is info graphics, where you can follow events and see statistics, also you will find a text comment and other useful information – last games and H2H. Unibet offers excellent live odds, so if you like to bet during the game, this bookmaker will be an excellent choice! Unibet welcome bonus is Money back up to € 25 if your first bet loses. The main advantage of this bookmaker is the endless list of promos that are timed to certain sports events, so you should always follow them in the ‘Promotions’ section. Multiple Free Bet. All you need to do is place at least one accumulator (with 4 or more selections) for a total of €10 or more during the week (until Sunday) and bookmaker will credit your €5 Free Bet to your account on Monday. But most importantly, you can get this bonus every week! The bookmaker pays much attention to such tournaments as NHL, NBA and NFL, offering American Sports Promotions of three kinds. NBA Live Free Bet Club: You can get €5 Free Bet each week if you place live bets a total of €20 at odds of 1.40 or greater during Monday 0:01 – 23:59 Sunday and Free bets will be on your accounts on Mondays. NHL Weekly Profit Boost: You do not need to do nothing – just take advantage and get each week a 20% Profit Boost to use on the NHL games! Get extra profit with Unibet Casino promotions: join the Casino Championship and play any slots and you can get a share of the weekly €10,000 prize pool and awarded 365 days of €10 Free Bonus Money. You can open Unibet account in different currencies including GBP, EUR, DKK, NOK, SEK, CHF, PLN and more. Do not forget that you cannot change currency once you have opened an account! Minimum deposit is €5, minimum withdrawal is €10. You can use next payment methods: Debit Card, Credit Card, PayPal, Skrill, Neteller, PaySafeCard (no withdrawal), Bank Wire and Entropay. Approximate withdrawal time: up to 12 hours for PayPal, Skrill and Neteller; 3-5 days for Debit Card, Credit Card, and Bank Wire; 1-3 days for Entropay. Unibet customer support is available in a few local services: Sweden, Norway, Denmark, Belgium (French and Dutch), Finland, UK and Romania. First, we recommend viewing all FAQs. As usual the most fastest and easiest way to contact customer support is Live Chat on the website, which is available 24/7. You can send e-mail to the company’s experts (info@unibetsupport.com).